Happy Are you all finist baking for Christmas? I love to bake close to Christmas so everything is fresh. Made som vanilla Meringues today, They are so delicious. I added two tsp. 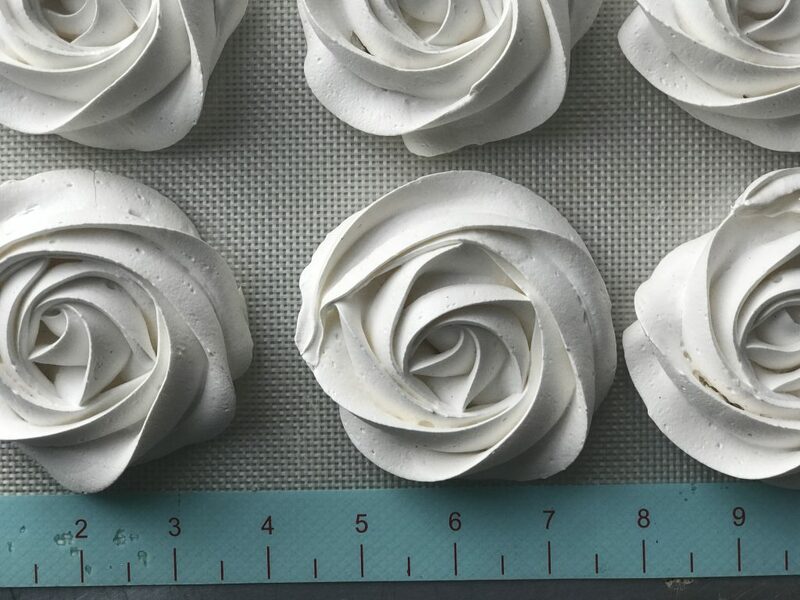 with vanilla bean paste at the end and pipped som beautifull roses with a wilton #1B nozzle, it so easy and I love these white roses for Christmas. 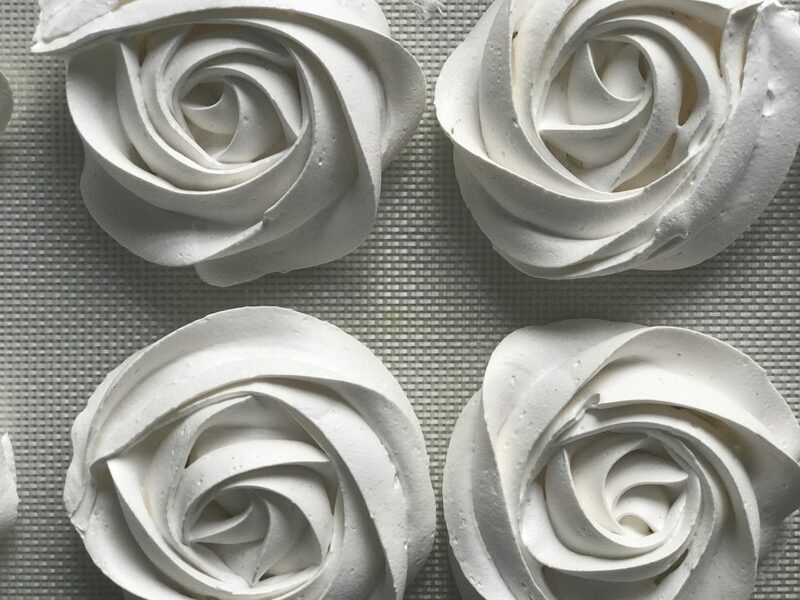 If you don´t know how to pipe roses, or make meringues, watch this video on my YouTube channel. Line two large baking trays with a silicone mat, or use parchment paper and set aside. Prepare the standing mixer, by wiping the standing mixer bowl and whisk with a paper towel moistened with a little lemon juice to eliminate any trace of grease. A soon as the sugar is in the oven, right away pour the egg whites into a mixer and whisk them slowly for some minutes, allowing small stabilizing bubbles to form, then increase the speed to medium so the meringues become stiff peaks. When you have 30 seconds left of the sugar being in the oven, turn your mixer up to high speed. With your mixer on full speed, very slowly add one teaspoon of the hot sugar into the beaten egg whites, take your time when you do this, and don’t be tempted to add more than one teaspoon at a time. Once you have added all the sugar, continue to whisk on full speed until you have a smooth, stiff and glossy mixture and all of the sugar is incorporated. Add the vanilla bean paste and continue to mix for one minutt more. 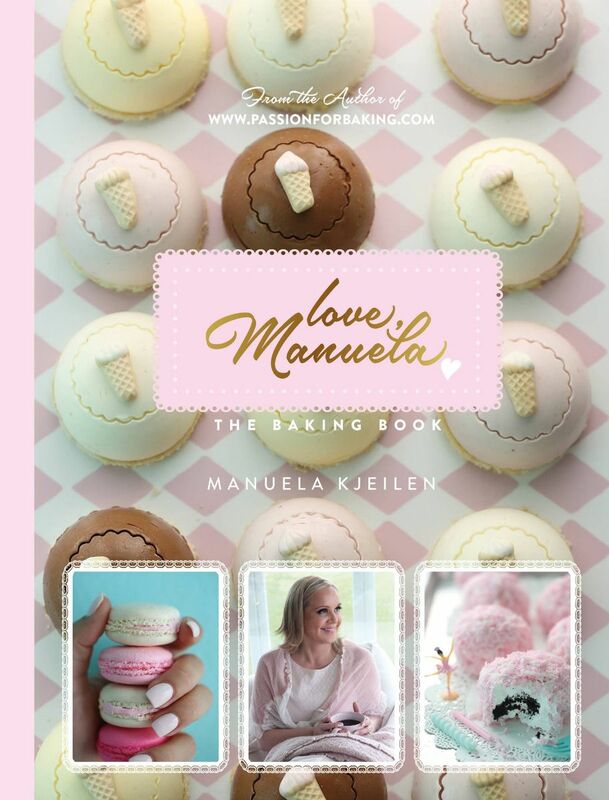 You will need a disposable piping bag and an wilton 1Bnozzle, place the nozzle in the bag and cut the tip-off. 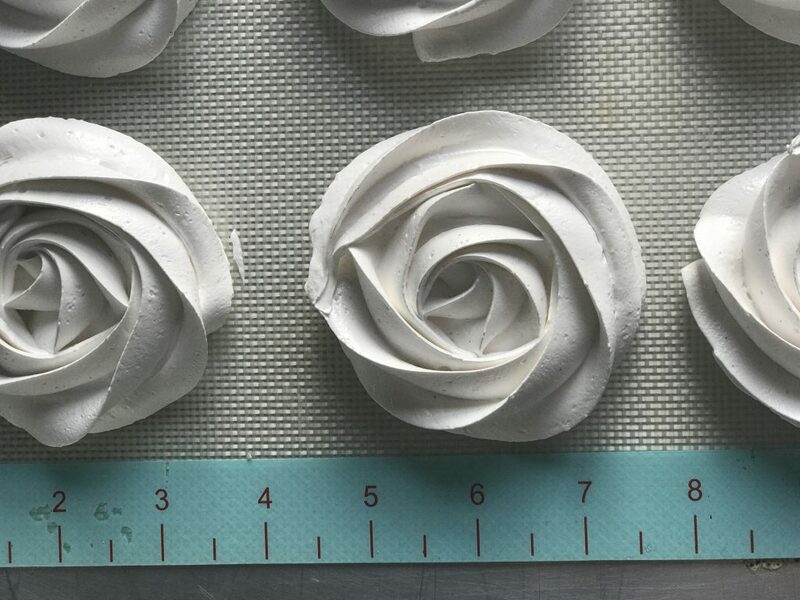 Spoon your meringues mixture into a large piping bag. 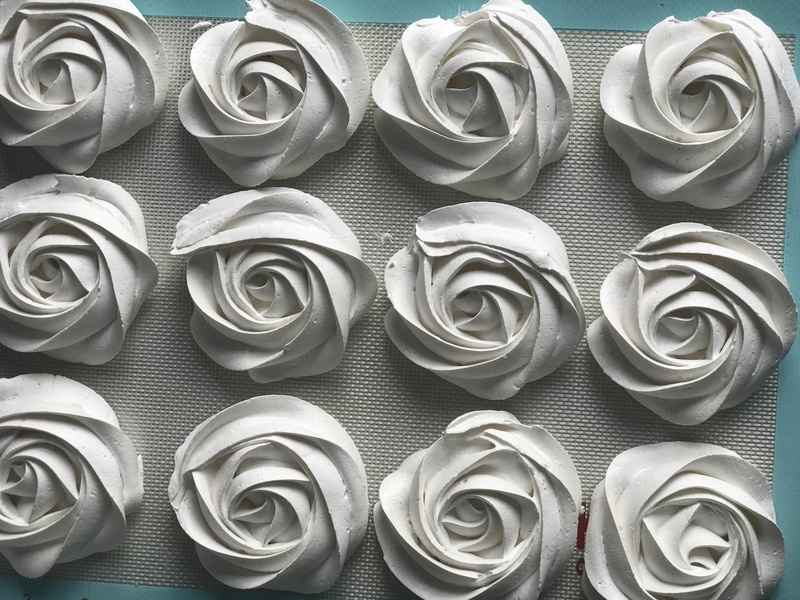 If you are using parchment paper to pipe the meringues on, you will need to add some meringues mixture underneath the parchment paper below so it sticks to the baking tray. Bake for about 50 minutes or until the meringue bases come off the parchment paper clean. These vanilla meringues keeps well for 2 weeks, in a container or wrapped in plastic wrap. 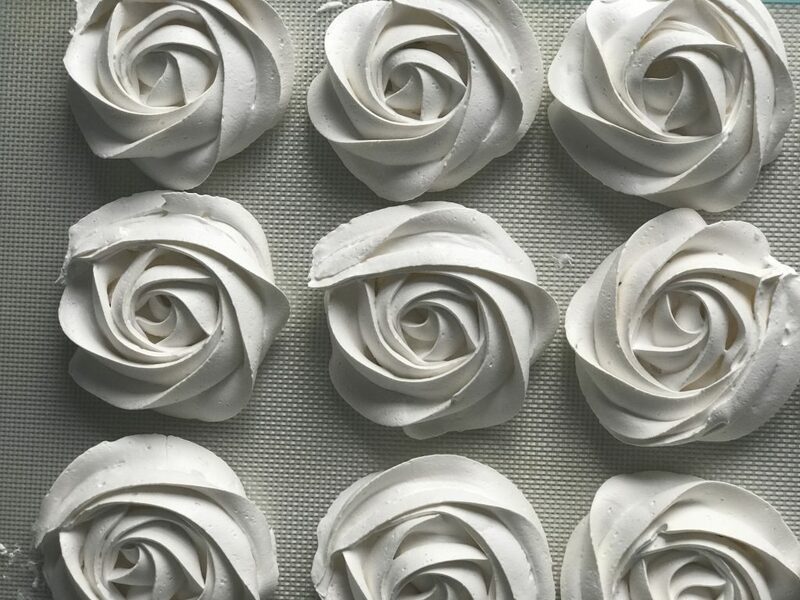 I am wondering what the difference is between your Meringue Rose cookies and your Vanilla Meringue Roses? Are they both not meringues? Why do you bake your sugar?